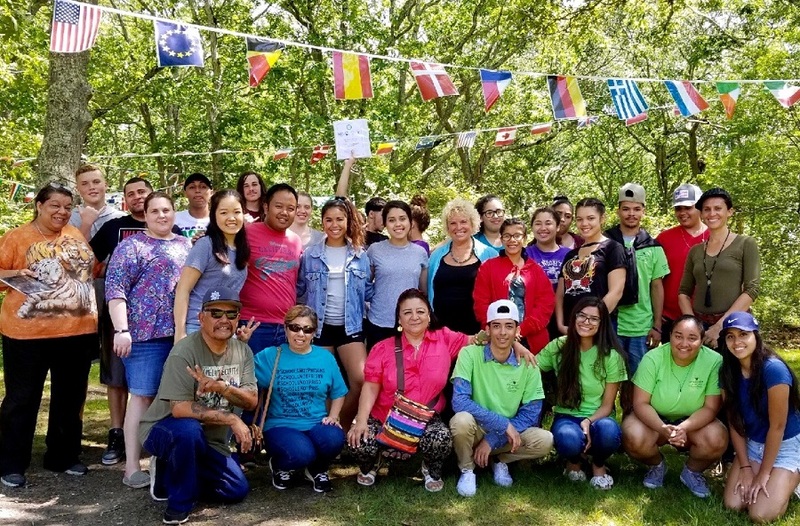 What a brave thing: On Friday afternoon, thirteen Holyoke youth-donned in neon green shirts signifying growth and new beginnings (and sustainability). 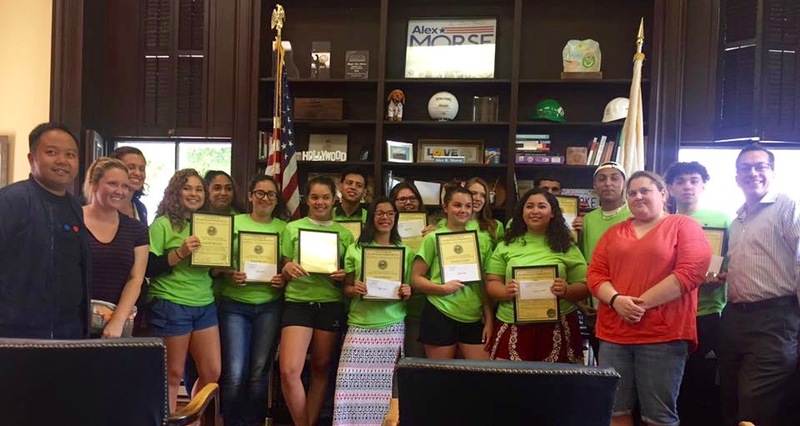 Nominated by their schools and community leaders, these youth delegates received Mayoral Citations to proudly represent Holyoke. They climbed into a large van to begin their journey to Martha's Vineyard. Some had never before left Holyoke, let alone embarked on a three-hour van ride to a ferry that would lead them to an island eight miles off the shore of Cape Cod. To spend a week with young people around the world. 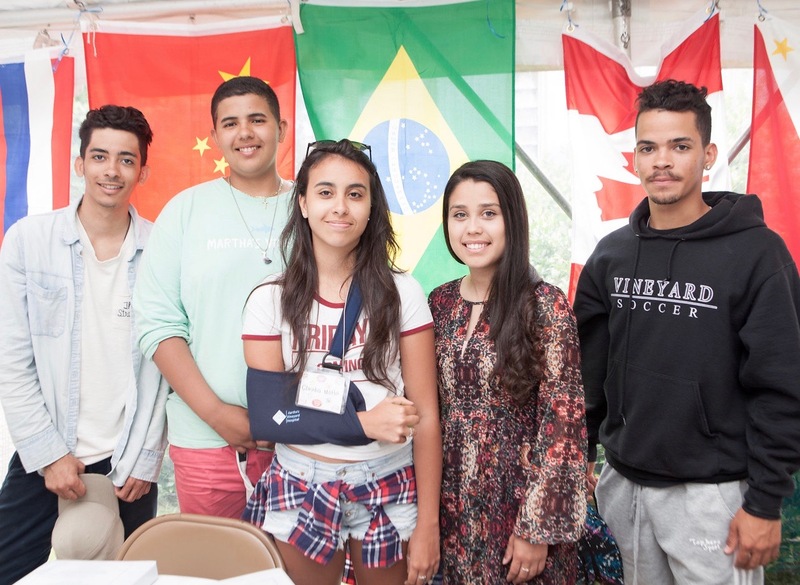 Once on-island, Holyoke delegates were met by other youth delegates, Emerging Leaders from Martha's Vineyard, Hawaii and Faculty from around the world. The 2017 Summit had a rainy start-not the best news for those looking forward to kayaking. 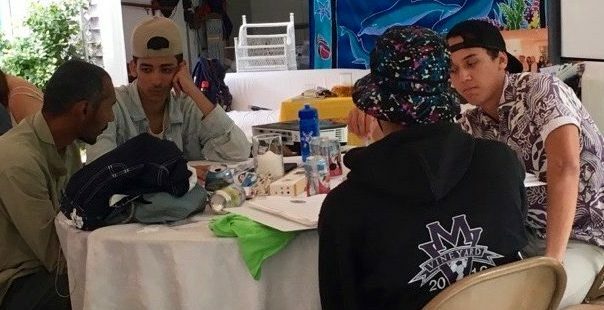 The storm proved to be a blessing, as the delegates and faculty used the indoor downtime to get a head start on their Dream Collages. The Summit encourages youth to envision their dreams-for their lives, for their communities, and for their world. Equipped with magazine cut-outs and lots of glitter, they created masterpieces! Most youth delegates want success in their personal lives, and to build a more peaceful and kind world-something they realize starts at home in their individual communities. It was also a good time to come together to share the challenges that stem from spending time away from home and define steps that could be taken to make the adjustment more comfortable. Discomfort is often the first sign of growth and expansion-something that each of the youth can now speak on. Changing one's life is often uncomfortable, and adapting to new experiences, making the best of a situation, and developing resiliency are all key components to leadership. By the afternoon, the sun decided to show her face, and everyone was excited to explore the gentle beauty of Menemsha Beach in the nearby village. 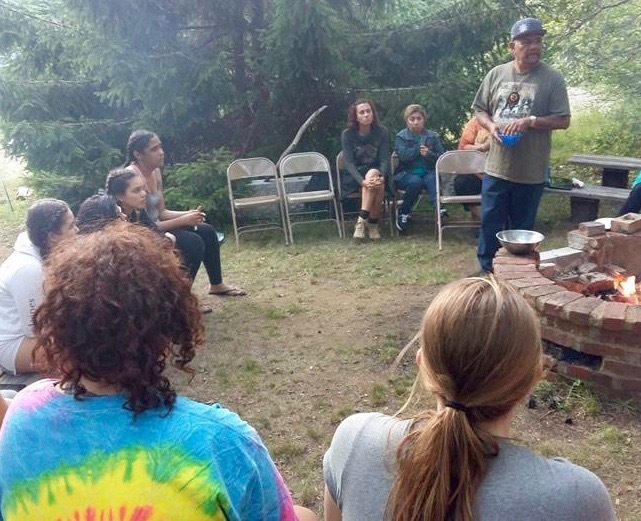 Later that night, youth sat around the fire pit, to join in a powerful Native American ceremony led by Nane Alejandrez, Barrios Unidos. "...One by one everyone joined this emotional mind-opening ceremony," said Alexis Diaz De Jesus. "There was an overwhelming feeling of acceptance and righteousness that cascaded over the group like pouring rain. Every person shared some pain, and after those moments nothing felt the same. 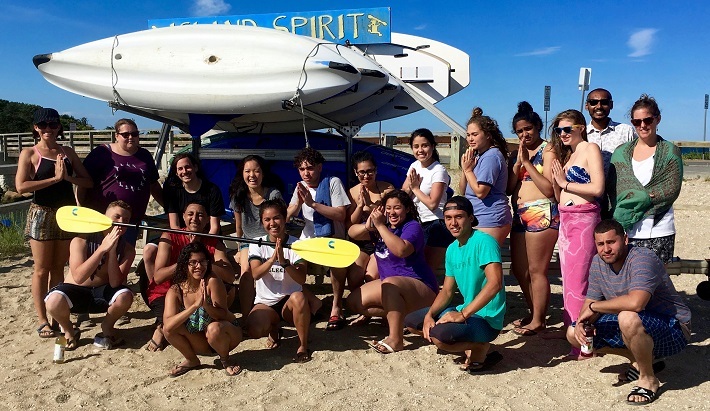 I understood that every person comes from some place and has an amazing story or advice to share so there's no room for judgement..."
After the Fire Ceremony, the youth felt more connected to each other and the Summit Team. 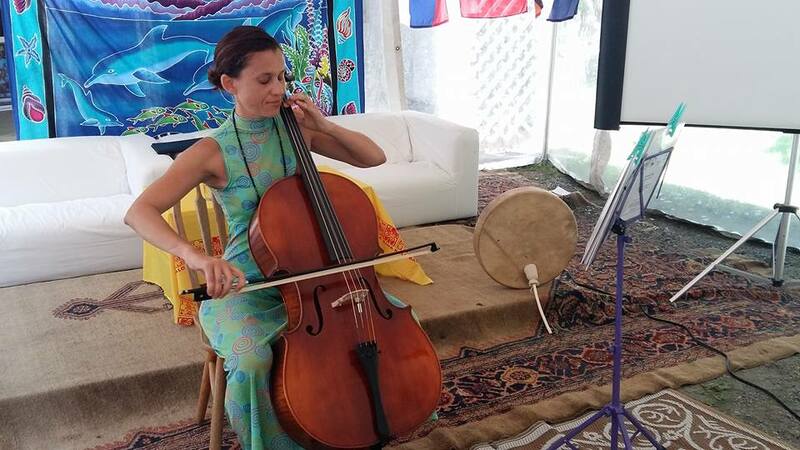 They made an effort to practice more openness and mindfulness while interacting with each other. It was another important step towards leadership. 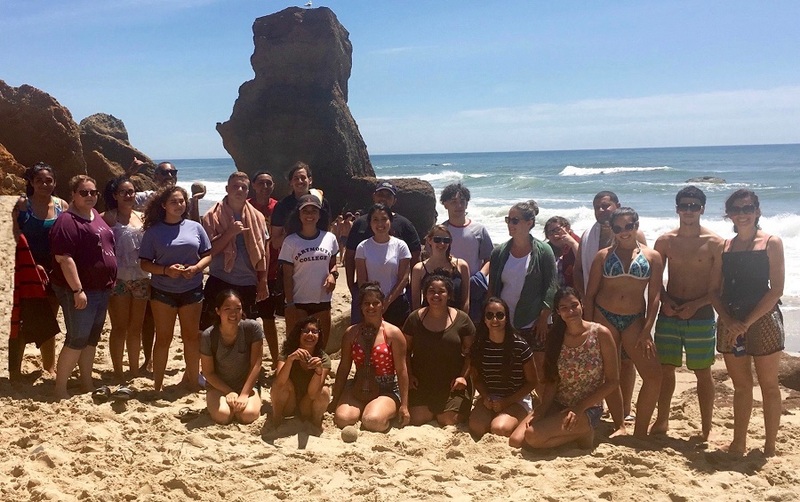 Youth delegates traveled first to Lucy Vincent Beach to see first-hand the powerful effects of crashing surf on coastal erosion and climate change. They also learned how walking silently on a beach and asking "what's next in my life?" led Marianne to this special beach. Finding a magic stone ultimately led her to write the book, Stone Soup for the World: Life-Changing Stories of Everyday Heroes. dedicated to her 19-year-old brother Chris who was killed by a drunk driver, and then create the Stone Soup Leadership Institute to train young people to become leaders in their lives and the world. 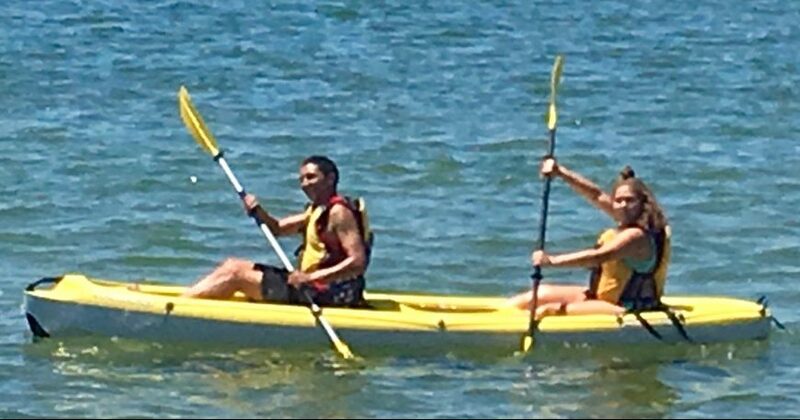 They then headed to Oak Bluffs to experience some long-awaited kayaking lead by Island Spirit Kayak. 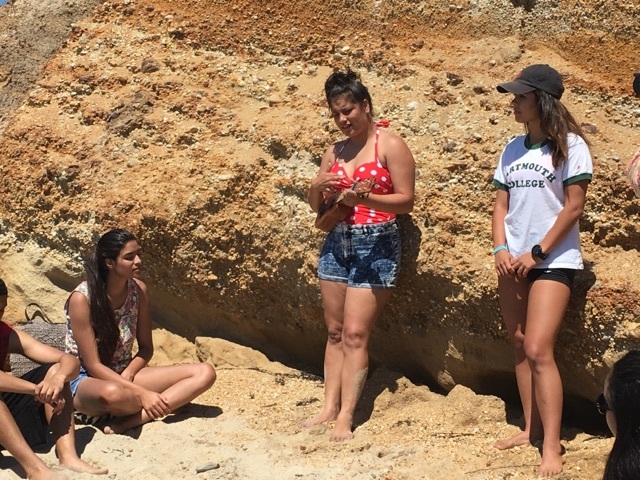 They were given an educational tour, and youth delegates learned about the fragile estuary and marine eco-systems and how people on Martha's Vineyard aim to protect them-by planting a million baby oysters to reduce nitrogen levels. As a special treat, delegates had fun jumping off the famous "Jaws Bridge"...A young person's summer delight on the Vineyard! Monday was the Official Summit Opening Ceremonies. Youth delegates proudly read letters from dignitaries such as U.S. Senators, Governors, State Legislators and Mayors. They received a Summit Curriculum, filled with a variety of resources, presentations and inspiring messages. 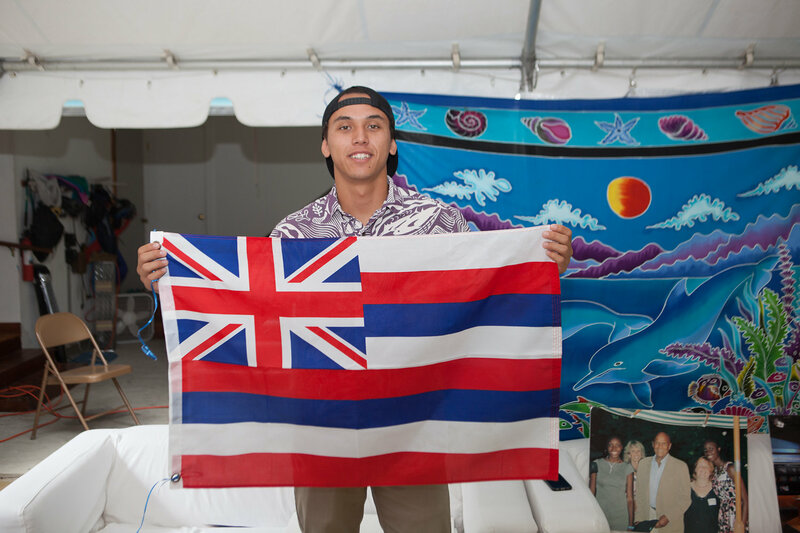 Cultural Sustainability: Flags representing every youth delegate's country lined the Summit tent's walls. 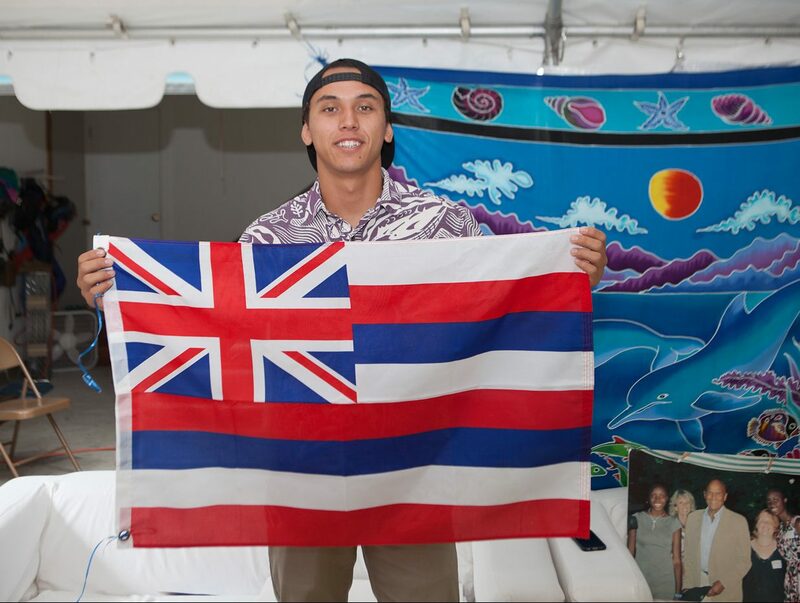 Delegates shared about their families' culture and background before taking pictures with the flags they identified with. 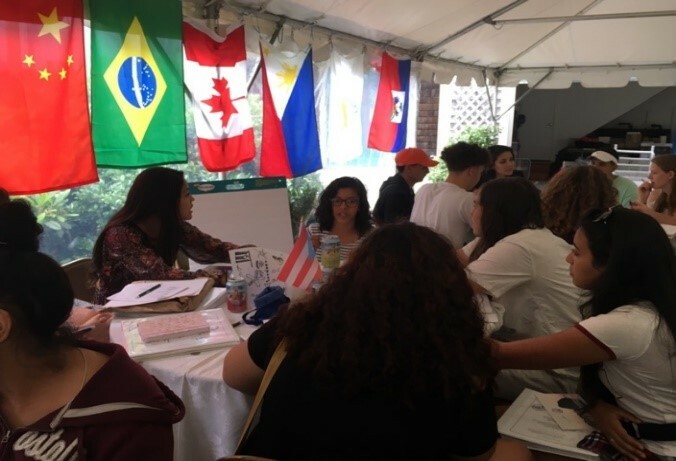 During the week the youth learned about other cultures and languages by choosing daily Leadership cards in a variety of different languages: Hawaiian, Spanish, Portuguese, Japanese, Tagalog (Philippines) and English. Every morning, youth listened to presentations from Summit Faculty on components: Cultural Arts, Entrepreneurship, Design Thinking, Time & Project Management, and 5 Year Plan. Each presentation stressed putting plans into action. See Presentations. Professional Workgroups: youth worked with Emerging Leaders and Faculty to share their career dreams and explore opportunities in their fields: Business/Entrepreneurship, Engineering, Performing & Cultural Arts, and Health & Medical. The Summit Team answered questions, offered support and advice, encouraged them to develop 21st century skills; and commit 100% to their dreams, despite the large amount of work and dedication needed to pursue their professions. Jason Gavina presented The Institute's Platform and Life Planning Tools and Dream Map™ to keep track of their dreams and plan out their future steps. Each youth came away with professional headshots and personalized bios they can use to apply for college and future jobs. They used Professional Worksheets to list action steps and create a timeline to keep on track. Five Year Plans put their thoughts and ideas into action. 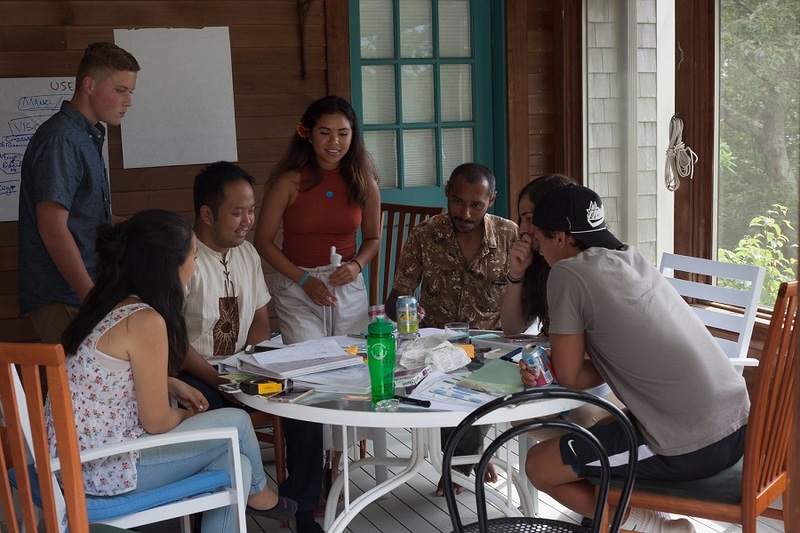 SHYLI Emerging Leaders and youth delegates worked with Ravi Pare, Design Thinking strategist to envision SHYLI's Sustainable Education Toolkit. Every afternoon, youth participated in workgroups: Cultural Arts with Kutasha: creating a performance for the Summit Graduation. Entrepreneurship with Kassandra designing cool jewelry and souvenirs. 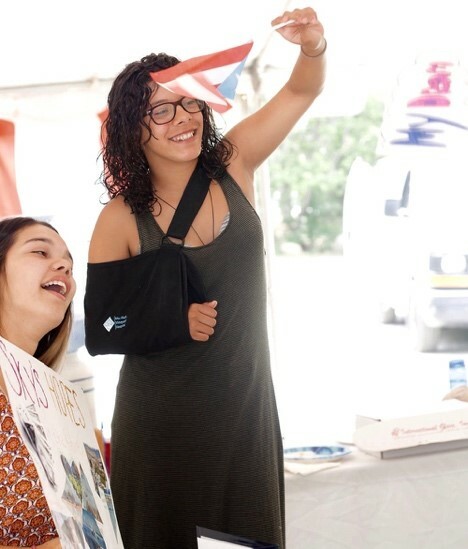 "Kassandra taught us that you don't need anything big to make money," says Nailene Diaz. "She made money by selling cans and other small things. She learned to make do with what she had. She never gave up no matter what. Kassandra beat all the stereotypes on her island. That really inspired me." At the end of the week, the youth delegates took the Post-Summit Performance Metrics to show their progress in just one week - and help them see their personal strengths and areas for improvement. "It was an honor to be an Emerging Leader," says Jackie Noborikawa. "While I expected to improve my leadership skills, I also made a new family. The delegates really made this year's Summit special, and I am thankful for them. Each delegate has the potential for greatness, they have the internal power to reach their goals and succeed in life." 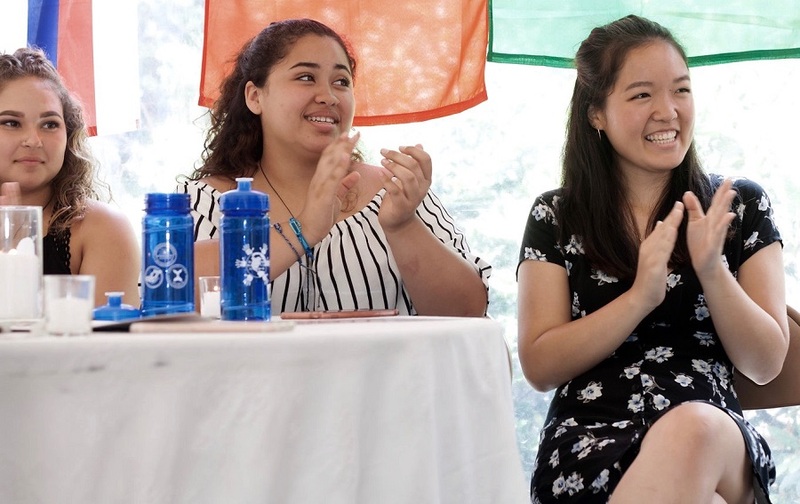 At the Summit's Graduation , delegates proceeded into the tent, each of them holding a burning candle, lighting the path forward and signifying the light and the power they each represent to their communities and the world. Youth delegates received citations from U.S. Senator Warren, Massachusetts Governor Baker, Hawaii Governor Ige, and Graduation certificates from the Stone Soup Leadership Institute. The Cultural Arts Group with Kutasha Silva performed beautiful rendition of John Lennon's "Imagine"-complete with ukuleles, maracas and cellos-and everyone participated in singing Bill Withers "Lean on Me" after joining hands to create an unbroken circle. The bravery of these delegates shone once again. Now even more dedicated to strive to reach their dreams and empower their communities. The Martha's Vineyard delegates have been part of the Institute's year-round program (2010-2017). Ana Alves, a Summit Visioneer, looks forward to staying in touch with the Holyoke delegates. "I now know I can be whatever I want, I just need to believe in myself," he said. "I also learned it's fine to change your mind and to experience new things, because that's how we learn." 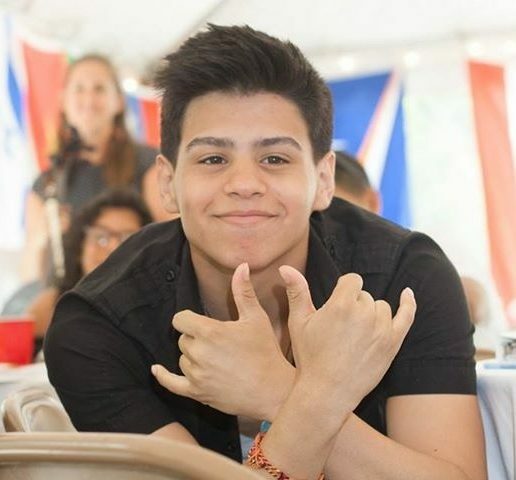 Gustavo Ramos said: "I was nervous [at first], thinking no one would like me. But after the first few hours with wonderful people, I realized that this was my new family (#mvyokeian)! 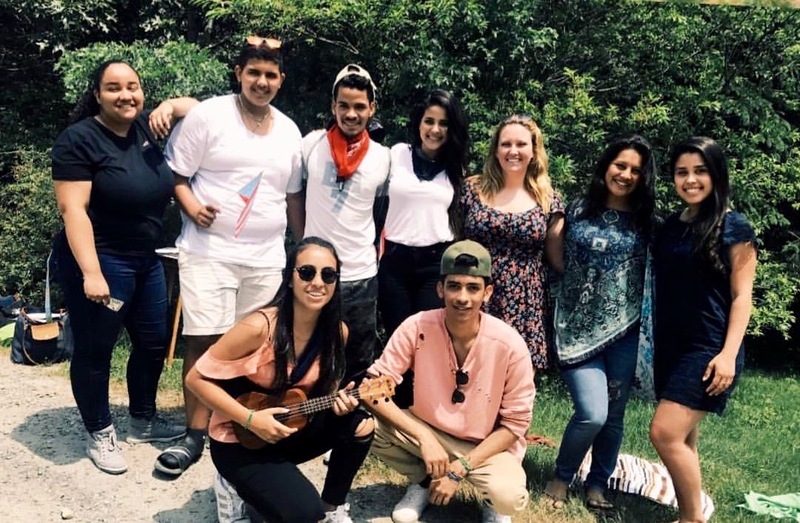 On the last day I cried, but it was sadness mixed with joy, knowing the next Summit is bound to be even better..." "The Summit was a great experience," says Nailene Diaz Holyoke delegate. "I got to learn a lot about myself and different people from around the world. I got to learn about sustainability too. The moments that stand out the most to me today are the ones shared with my new family, the Brazilian youth from Martha's Vineyard. MVYLI helped me get here where I am today - an incoming sophomore at Gordon State College - becoming a doctor! Being the first person to go to college in my family is a huge blessing -- but going through the process wasn't easy. MVYLI provided me with the help and resources I needed. Having Brazilian youth in MVYLI makes me so happy. A lot of times Brazilians don't feel like they can achieve their dreams. MVYLI helps them realize anything is possible if they are willing to try their best and set their mind to it. They also create opportunities for the Brazilian youth that they otherwise wouldn't have. MVYLI not only is a useful resource for the youth but we became a family this past Summit. 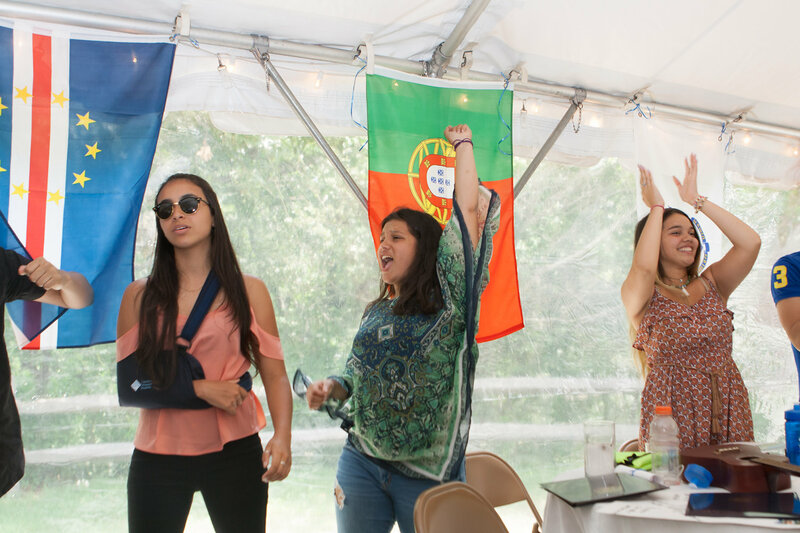 As an Emerging Leader working with Brazilian youth, I learned more about their dreams. During the career path day I worked with those interested in a career in medicine. I was in awe to see the passion these young adults had and to learn so much about what they've already accomplished. I hope Brazilian youth keep taking advantage of this amazing opportunity. I believe in every single one of them and know they can accomplish all their dreams. Thanks MVYLI for making a big difference in our community. Hugs are shared amidst the rush to catch ferries on the busy 4th of July weekend. 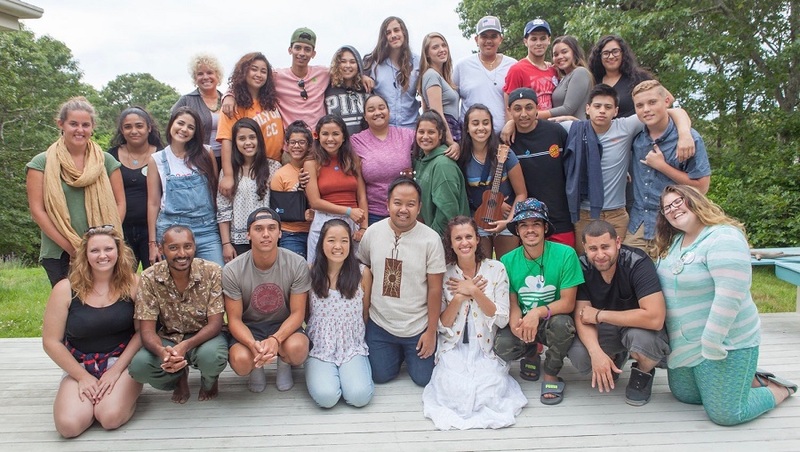 Summit youth delegates take their newly-forged relationships and their dedication to build a more connected, peaceful and sustainable world home with them. Kutasha is really pretty, funny, and an amazing person. I'm really glad I met her and got to know her at the Summit. I really enjoyed singing with her and all the new kids I met. She really brought us closer together with her specially written songs. No one was scared to sing because we all felt like family when we were around her singing. It was really fun hanging out with her at the campsite and singing a different song everyday. I really liked when we would wake up in the morning and she would be there to say good morning and brighten are day. I appreciate Kutasha for that a lot. Thank you. Being at the Youth Leadership Summit was absolutely phenomenal! I met great people with amazing personalities. There were really good presentations. Kassandra's presentation touched me because of where she came from and what she did to get to where she is now. Her story is really inspiring and it is helped me follow my dream of being a model/actor. In the coming months I look forward to continuing working with Kassandra and the Institute's impressive people - I think I'll make it out there in the real world!